Prepare, Season, and Get Started Grilling! The grill is the perfect piece of equipment for cooking mushrooms. Because mushrooms contain a high percentage of water they can remain moist under high, direct heat. As mushrooms lose moisture, the flavor of the mushroom (and anything you have added to them) is intensified. The trick with mushrooms is knowing the best cooking method for the mushroom size and how to add flavor as you grill them. You can grill mushrooms of any size, but you will need to use different equipment and cooking methods based on the size of the mushroom you are cooking. Mushrooms can lose as much as 50 percent of their size as they cook, so this must be taken into account when you choose your cooking method. You can cook larger mushrooms directly on the grates of the grill, taking into account how much they are likely to shrink. For example, large portabello mushrooms can be grilled on the grates as it if they were hamburger patties (and they make a good hamburger substitute). Medium to small mushrooms can be threaded onto skewers, which makes them easy to control on the grill. Basting or brushing with olive oil will help keep them from sticking to the grill. You will need to turn them to ensure all sides cook evenly. Smaller mushrooms or those with tender caps that won't thread easily can be grilled using a grilling basket. Sliced mushrooms or smaller mushrooms may also be grilled in foil packets. Include some olive oil and seasonings. Be gentle with mushrooms as they can break easily. It might be best to use tongs for turning and not forks or spatulas. Many people say that you should not wash your mushrooms in water. Cookbooks often suggest that mushrooms should only be gently brushed off to clean off any remaining dirt or debris. The truth of the matter is that most restaurants, even the fancy ones, rinse off their mushrooms to get them clean. You can brush each mushroom if you have a lot of free time, but water will not harm mushrooms if you rinse off the mushrooms right before cooking. Trim the dry end of the stems. You may remove the entire stem if it will get in your way, as with a portabello mushroom used as a burger patty. If you are using mushrooms as kebabs, leave the stems intact. Stems are denser and will help the mushroom hang on to the skewer. You have several options when it comes to flavoring your mushrooms. You can marinate them, mop them with a sauce, or sprinkle seasoning on them while they are on the grill. You can marinate mushrooms well in advance—up to a day or so. 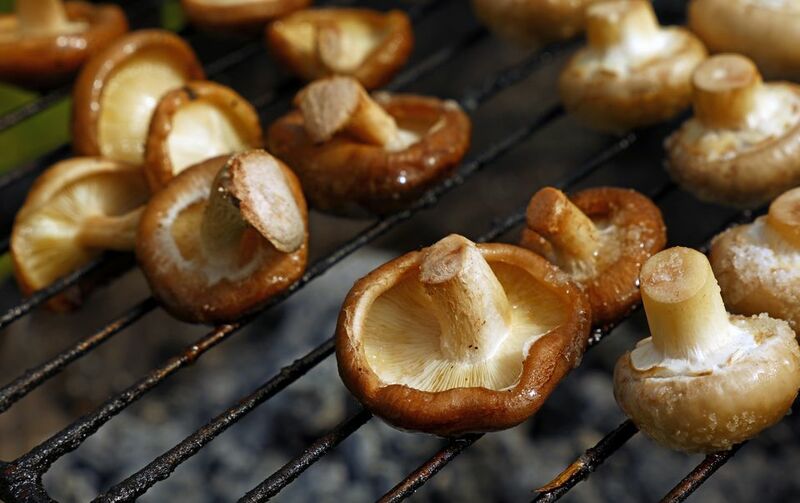 Mushrooms can dry out if you do not replace the moisture that cooks off them on the grill. An oil-based marinade will help lock in moisture. If you choose not to marinate the mushrooms, the mushrooms can be seasoned right on the grill. Mix a small amount of olive oil, garlic, salt, and other seasonings and baste (or mop) this onto the mushrooms as you cook them. Basting while grilling will also keep your mushrooms moist. If you are preparing mushrooms as a side dish, season them with the same spices that you use for the main dish. This provides complimentary flavors that tie the meal together. Marinated mushrooms will take about 10 to 15 minutes to cook well on the grill. Foil packets of mushrooms will take 20 to 25 minutes.